Ever wonder where you could find David Wolfe’s necklace, one of those awesome medallions that gurus of health, David Wolfe, Patrick Flanagan, and Gabriel Cousins wear? This is it! The David Wolfe Necklace designed by the genius Dr. Patrick Flanagan for protection of harmful EMF radiation and amplification of our healthy bio-electric fields, therfore it is much more than just an interesting pendant. Health gurus David Wolfe, Patrick Flanagan, and Gabriel Cousens all wear one of these necklaces designed by Dr. Patrick Flanagan himself, and Mohsen Hourmanesh. So, if you’ve been searching for the gold necklace David Wolfe wears, look no further. David Wolfe’s Necklace is designed by the genius Dr. Patrick Flanagan for protection of harmful EMF radiation and amplification of our healthy bio-electric fields. First, it’s important to realize that some of the greatest minds in health information do not subscribe to the philosophy or limited science of mainstream healthcare. Many of them approach health from a much deeper and expansively integrated belief system of how our bodies and nature work. David Wolfe is one of the most prolific, well-connected and busy health advocates in the world. In addition, he’s made it his life mission to discover and share the best of what’s available in health products and information. This is another reason why the Sensor V is worth exploring. Patrick Flanagan was deemed a genius as a very young boy. He’s in his 70s now, having survived survived Polio (contracted from the vaccine), and a lethal dose of mercury poisoning from swallowing it as a child. As a result of trying to heal himself, he’s gone on to produce some of the most powerful health supplements (Megahydrate) and devices available (The Neurophone, and The Sensor V). The Sensor V is a great solution to EMF radiation, and for protection from other harmful fields. It is specifically designed to help amplify and harmonize your own bio-electric field. Studies show it produces temporal and spatial coherence in fields, multi-fractal dimensions and organizes harmony in the entire area that surrounds it. Its geometry is as perfect as it can be. Since Phi is a transcendental number, it generates this attempt to decimal calculations to achieve its powerful effects. Due to it’s 5 sided phi pyramids, The Sensor V produces a vortex by perfect dimensions of the sacred geometry. Furthermore, it also contains a spiral vortex in the golden section. They’re all laid out in perfect coordination with each other. As a result, it literally generates a coherent, holographic, multidimensional vortex. For maximum effect, the Sensor V is cast in bronze and gold coated. The pendant is concavely curved, depth to the center as a shallow dish. The five-sided pyramids are ‘bundled’ smaller inward as well as the energy in the center of the sensor. Rather than thinking of the The Sensor V as a piece of jewelry, consider it more of a “pyramid engine”. First of all, it’s important to understand that the bio-energy field of the person is a kind of “energy plan”. Author Barbara Ann Brennan and many others believe that our physical body follows this blueprint. Essentially, this means that beginning of the process of our body’s physical expression is not DNA, but rather consciousness that creates form at a much more subtle layer as our bio field. In conclusion, The Sensor V harmonizes the energy field and stimulates positive changes to the physical body itself. PEB is a technology that can register changes in the bio-energy field. More importantly, a test for the sensor V examined these changes after 1/2 hour to over 2 hours of wearing the Sensor V and had some very positive results. The conclusion was that in addition to changes in cellular energy level, the evaluation also showed that the use of the Sensor V affects deep layers of the human energy system. The partially massive changes of the diagnostic curves show that the use of the Sensor V also has a profound impact on the systemic-psychological field result. All test results indicate compensatory changes, supportive and energetic influences on local, systemic and global levels. 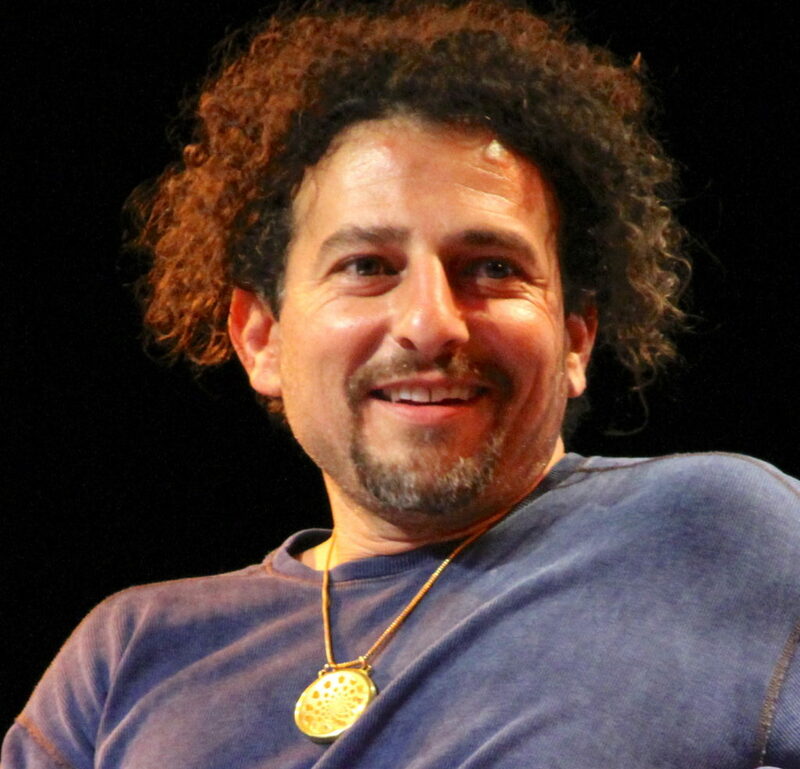 See David Wolfe’s Necklace, The Sensor V in the film “FREQUENCY OF GENIUS”. Gabriel Cousens and David Wolfe both wear and talk about The SENSOR V PENDANT, recommending it to others. Finally, If you would like to learn more about the genius of Patrick Flanagan, check out the great interviews of him on Gaiam TV (like Netflix for conscious minds). Learn his fascinating story and why he such amazing genius. Hear about how in 1962, LIFE magazine picked Flanagan as one of the top ten most promising upcoming scientists in the world. Patrick Flanagan is truly one of the most kind hearted, as well as brilliantly innovative visionaries alive today. The benefit to you is that the Sensor V is shown to be a powerful EMF (Electro Magnetic Field) protection device among its many benefits. The Sensor V is the result of 30 years of development by Patrick Flanagan. The last three years were intensive work on 3D Computer Aided Design Programs. As a result, the sacred geometric shapes of the sensor are calculated, and perfectly and accurately constructed. 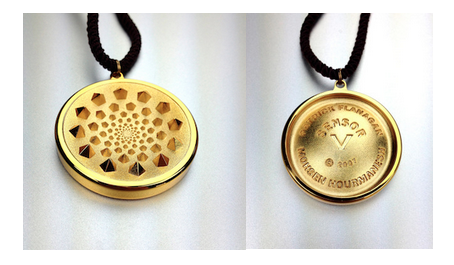 Most importantly, the 24kt Gold plated medallion is a scalar/ torsion field amplifier. This is helping protect you from harmful electro-magnetic radiation and discordant energies. while amplifying more harmonious ones. I prefer the double loop for the chain as picture in the photo of David. I do not care for the single medallion loop. Where can I find one like this? I’m hoping someone here may have some information I can’t seem to find anywhere else. I have a “Pat Flanagan Experimental Sensor 24k Gold”. It is 12 inches in diameter. I can’t find any information on a sensor this large. I would really like to learn more about it. Can anybody help? There are older versions of the Sensor V, but a 24k gold medallion that is “12 inches in diameter” would be very expensive. I’ve never heard of one this big.